PermaShade™ LC - Products - Procedure - Ultradent Products, Inc.
PermaShade LC light cure veneer luting resin is used exclusively for cementing veneers. Its ergonomic contra-angle syringe makes luting more convenient than other delivery methods. With enduring color stability, and low shrinkage, PermaShade LC is ideal for creating a long-lasting, esthetic veneer smile. ​Use PermaShade LC light cure veneer luting resin for permanent cementation of porcelain, zirconia, composite, and other indirect veneers. ​The unique and ergonomic contra-angle syringe allows for precise, controlled delivery. For optimal handling, bring PermaShade LC veneer luting resin to room temperature before use. ​Patient with four existing anterior composites and large diastema. Received six anterior A1 porcelain veneers (6–11) cemented with PermaShade LC veneer luting resin Translucent shade. ​Four veneers (7–10) were cemented using PermaShade LC veneer luting resin A2 shade. ​Six anterior porcelain veneers (6-11) are cemented with PermaShade LC. With enduring color stability, low shrinkage, and high bond strength, PermaShade LC sets the stage for a long-lasting, esthetic smile. ​Designed to give added precision and convenience, PermaShade LC's unique syringe gives both ergonomic comfort and is perfect for use with smaller veneers. ​Clean preparation, rinse, and dry. (We recommend Consepsis® Scrub CHX antibacterial solution and STARbrush® intercoronal brush to clean, disinfect, and remove residual cement.) Verify prosthetic fit. ​Etch clean bonding surface of the veneer with Porcelain Etch for 90 seconds, rinse, and dry. Apply phosphoric acid (Ultra-Etch®) for five seconds to remove porcelain salts and debris formed by hydrofluoric acid etching. Rinse and air dry. ​Apply a puddle coat of Silane to inside surface of prosthesis for one minute, dry, and set prosthesis aside. Do not rinse. ​Apply Ultra-Etch etchant to enamel and/or dentin for 20 seconds. Rinse thoroughly for five seconds and leave damp. ​Apply a puddle coat of Peak® Universal Bond with the Inspiral® Brush tip. Gently agitate and coat surface for 10 seconds. Thin/dry for 10 seconds using full air pressure. Preparation should appear shiny. ​Light cure with VALO® LED curing light for 10 seconds. ​Express a thin layer of PermaShade LC onto the inside bonding surface of the veneer. Carefully position and seat the veneer using gentle pressure. Tack cure for two seconds to avoid shifting. Clean the excess cement from margins and light cure with VALO for 10 seconds. In what shades is PermaShade LC available? ​PermaShade LC is available in four VITA® shade options: Translucent, Opaque White, A2, and B1. What is the viscosity of PermaShade LC? 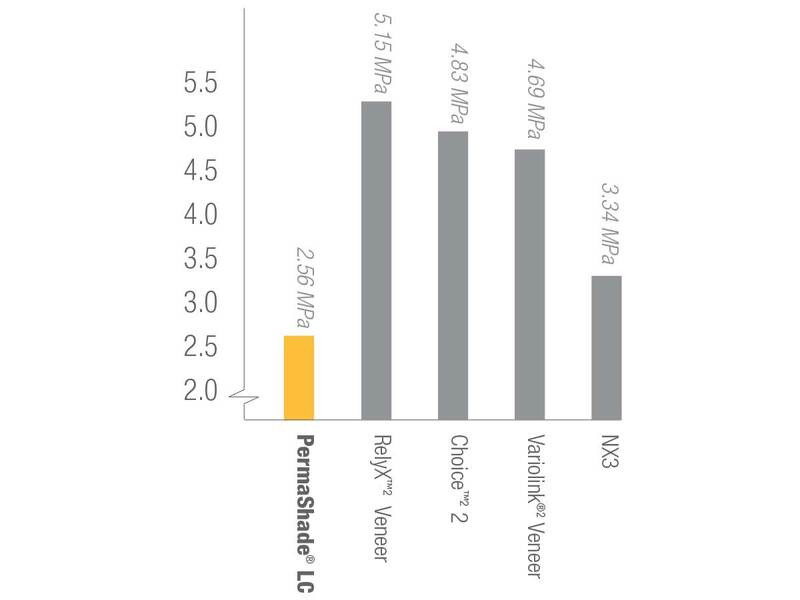 ​PermaShade LC has a medium viscosity. How should PermaShade LC be stored? ​Refrigerate PermaShade LC when not in use. For optimal handling, bring PermaShade to room temperature at least 2 hours before cementation. Can PermaShade LC be used to lute a crown? ​No. PermaShade LC is a light-cured material and a crown may be too opacious to allow for complete light curing through the prosthesis. Approximately how many veneers can be cemented using one syringe of PermaShade LC? 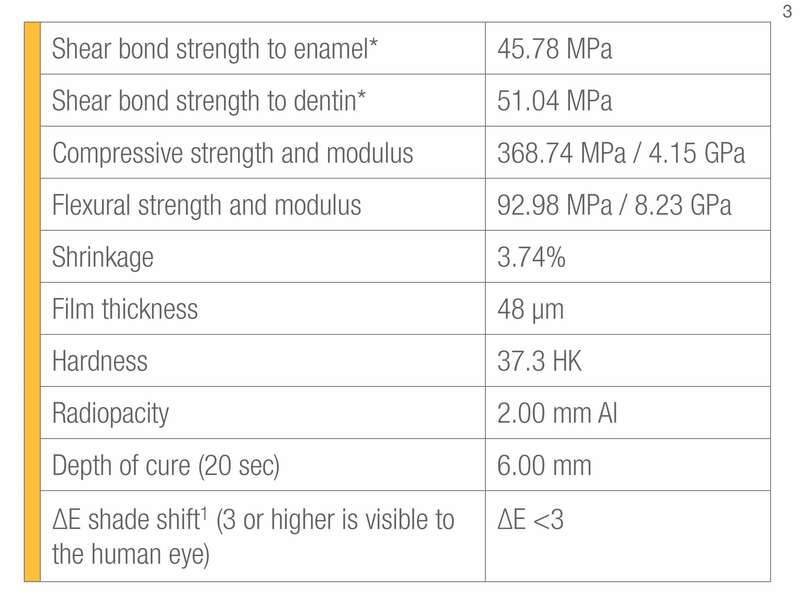 ​Depending on how liberal or sparing the clinician is, one syringe (.95g) can be used to lute between 17 to 21 veneers. Barghi N, Gureckis KM, McAlister T. Color stability of two luting resins. J Dent Res. 90(Spec Iss A):1685, 2011 (www.dentalresearch.org).